Lake Tahoe is a huge family destination and there are many many activities for kids of all ages all year around. Listed here are are some of the best activities for your kids in the Lake Tahoe Basin. Lake Tahoe is a huge family destination and there are activities for kids of all ages during winter and summer. A day on the slopes can include skiing for Mom and Dad, and snow tubing or boarding for the kids. A day in the summer can include sunbathing and swimming on a brilliant beach, or easy walks in the great outdoors for both parents and toddlers. There are also options to drop the kids off for a few hours to play under the capable supervision of someone else while you go off on your own adventures... Hmm? Listed here are are some of the best activities for your kids in the Lake Tahoe Basin. Map markers 3 & 5 are really close together! This is the ultimate kids camp. The Camp Hyatt Lake Tahoe is for children ages 5-12 and will introduce children to fun activities that includes swimming, hiking, nature walks, movies, treasure hunts and story time. The employees of Camp Hyatt introduce children to the natural world throughout the year and interject fun games along with learning. A day session is from 9 am to 4 pm and includes lunch for $75 per child. Please allow 24 hours to make a reservation. 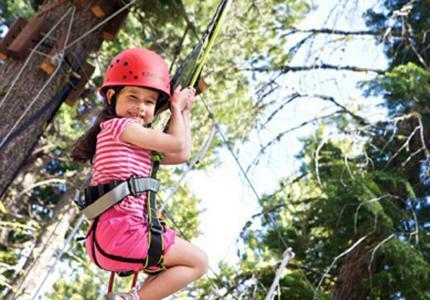 The Tahoe Tree Top Adventure Center is located at Granlibakken on the West side of the lake and features various ropes courses, aerial walkways, tree platforms and zip lines for all ages. Children are in the capable hands of the Adventure Center crew who will lead them on to some great rides. Smaller children will enjoy the Flying Squirrel courses that feature ropes courses 8-10 feet off the ground, while Teens will enjoy the 500 to 1,000 feet zip lines that are nearly 40 feet off the ground - thrilling! Owned by the same company who owns the Tahoe Tree Top Adventure Center, the Squaw Valley Adventure Center also has a ropes course, a Skyjump Bungee Trampoline, a Climbing Wall, and a Mini Golf course. The Center is mostly for children under the age of 13. 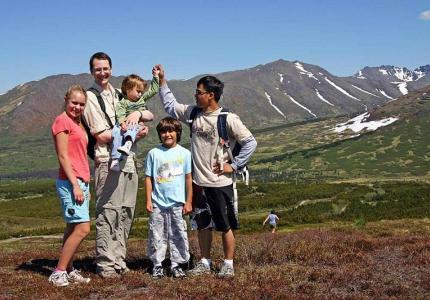 Group adventures are also available and feature personal discovery challenges like hiking, snowshoeing, orienteering and kayaking. If your young one loves ropes and bungees, Northstar on the North Shore has a fun (and safe) bungee trampoline that lets both kids and adults fly in the sky over this beautiful ski village. The price is only $13 for 5 minutes. Also at Northstar is the Apex Ropes Challenge that has eight different levels for various ages. Begin your ride up to Squaw Valley's High Camp on their famous Aerial Tram up to 8,200 feet. Up here you can let the kids play to their heart's content in the outdoor swimming pool, hot tub, ice rink, roller rink or even along the area's hiking trails. Other free activities for all ages include the slack line park and the ladder toss game area. If your children are into ice skating or hockey, this year-round Olympic rink will give them the space they need to practice or pirouette. The South Lake Tahoe Ice Arena offers open skating, lessons, hockey games, curling and school programs. Some weekend nights also have black light skating. You can rent skates and equipment at the arena and they also have bucket assists available for beginner skaters and children. Please check the website for current skate times. For babies, toddlers and very small children, the KidZone Museum in Truckee has learning exhibits that encourage children's developmental skills. The KidZone has a BabyZone for those under 18 months, an Art Studio with crayons, markers and clay, a Jungle Gym with a custom train table and an Exploration Station where the kids can create their own science projects. Special programs and workshops are also available including learning about the natural world, puppetry, Show and Tell and building with wood. Admission is free for infants and $8 for ages 1-69. The KidZone also offers a free bus from Kings Beach and Truckee. The Tahoe Donner ski area offers a summer day camp for children ages 3-14 for several days of Tahoe fun. The camps are packed with both learning and outdoor sports activities including beach outings, hiking, biking, river rafting, rock climbing and exploring the High Sierra. Prices for the day include care, activities, transportation to various areas around the lake and lunch. Named after the legendary monster that has (reportedly) been seen in the lake, Tahoe Tessie's Summer Camp teaches children and preteens how to swim and stay safe during water sports. The day camp features water skills classes, swim instruction, training games, stand up paddle boarding (SUP) and kayaking, surfing, beach games and water races. Older children (ages 12-14) can also learn how to be a junior lifeguard.